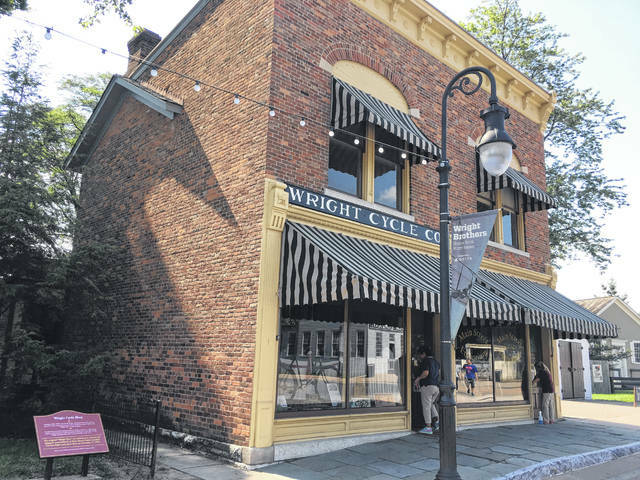 At the Henry Ford Greenfield Village stands the original Wright Cycle Shop, which Ford had disassembled in Dayton, boxed up and shipped to Detroit and then re-assembled at his Greenfield Village tourist/museum complex. Detroit has cool skyscrapers and a monorail system called the People Mover. 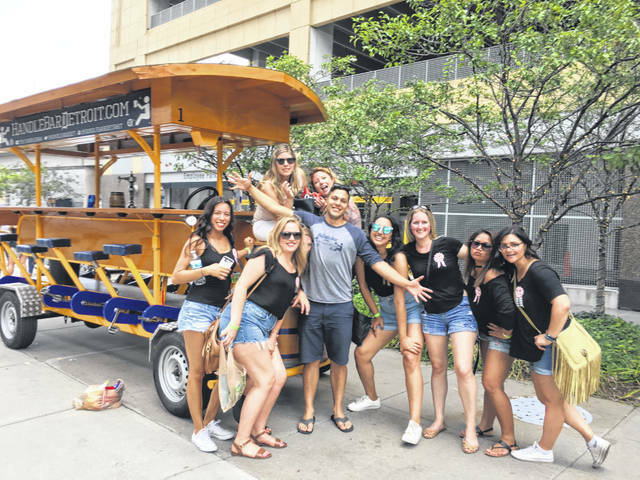 Pedal Pub Tours are fun and popular in Downtown Detroit. These Canadian gals love Detroit and say the best part of living in nearby Windsor, Ontario, Canada, is being close to all the great things Detroit has to offer. DETROIT, Mich. – Everyone has heard one thing or another about Detroit and let’s face it, it’s usually pretty negative. Detroit has really gotten a bad rap lately, though. 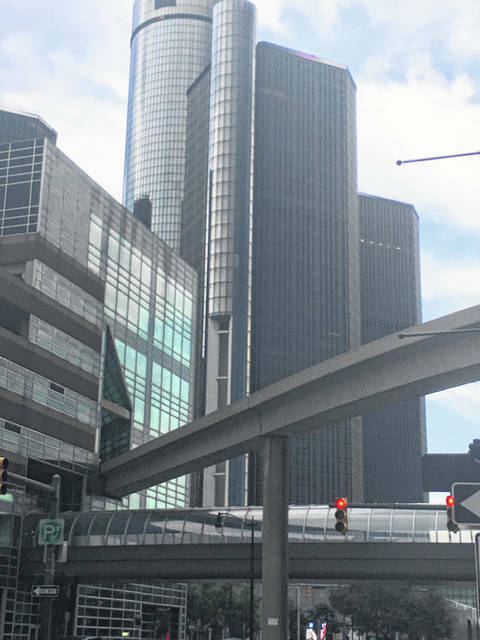 Downtown Detroit is becoming a revitalized, vibrant city on the rebound if you haven’t heard yet. It currently has $5.1 billion in new construction going on. It’s really an undiscovered gem of sorts, believe it or not. If you take the three-hour drive to Detroit you will discover something completely different than the negative stuff you hear on TV and read in the newspapers. It is not an abandoned, desolate ghost town with trees growing out of skyscrapers as many would lead you to believe. Sure, outside of downtown Detroit there are some not so attractive areas, but isn’t that the case with any other big city in the U.S.? Downtown Detroit is different though. Downtown Detroit is a really cool, vibrant and bustling place. It offers everything one would expect in a major downtown city and a little more. It has character and mojo too. It has a nice combination of historical charm and big city modern skyscrapers and attractions. Detroit, known as the Motor City, at one time was the 4th largest city in America. It is still a major US city with a metro population of over 5 million people. Americans have been convinced by bad statistics and gloomy media coverage that Detroit is to be avoided at all cost, but Canadians who live just across the border in Windsor feel just the opposite. “The best thing about living in Windsor, Canada, is that we are so close to Downtown Detroit,” said Maaya Kaul, a University of Windsor student. “Detroit has really been overlooked by many. We come over here all the time and have a great time. We just love Detroit,” Kaul added. “Detroit really has so much to offer, it is a great tourist destination and an exciting city,” adds Mary Beth Colquhoun from London, Ontario. The downtown district is a safe, cosmopolitan hub of big activity with a dynamic culinary scene, featuring everything from high-end dining with international tastes to Coney dogs. It has one of the largest theater districts in America, new hotels, music venues, a really cool walkable international riverfront, scenic and social parks and cool bike paths. Detroit boasts an NFL, NBA, MLB and NHL team, outstanding shopping, exciting outdoor activities, world-class cultural attractions, riverboat tours, a streetcar train system, a people mover monorail, and two major sports arenas side by side, Ford Field and Comerica Park. Regarded as a major cultural center, Detroit is known for its contributions to music from Motown to jazz and rock. It is also known as a great repository for art, architecture and design. It’s a nice down to earth mix in Downtown Detroit with world class architecture featuring structures by Isamu Noguchi and Albert Kahn being right next to all-night joints selling loaded Coney dogs and nearby speakeasies pouring locally crafted beer and cocktails. Check out the skyscrapers at the GM Renaissance Center right on the Detroit River overlooking Caesars Windsor (Canada), it’s out of this world! They’re even building a new skyscraper. A $1 billion, 1.1 million square foot, 58 story tower is currently under construction. And everyone thought Detroit was dead. Nope. Instead it’s actually growing. The city’s Greektown, Corktown, Eastern Market, The District Detroit, and Midtown neighborhoods are also booming with activity. It’s also the the casino capital of the Midwest with big-time venues such as the MGM Grand, the Motor City Casino and the very sleek Greektown Casino. Detroit has great tourist attractions that are second to none such as the Detroit Institute of Art, the Henry Ford Museum and Greenfield Village, GM Renaissance Center, Motown museum, MGM Grand, Belle Island, Comerica Park, Ford Field, Detroit Historical Museum, Cobo Center, Detroit Zoo, Greektown Casino, Fox Theater, City Tours, Segway Tours, Scooter Tours, the Guardian Building, Sound Board Theater, Sea Life Aquarium and Legoland, Chene Park Amphitheater and the list goes on and on. And then there’s Canada, literally just 5 minutes away. Drive over the Ambassador Bridge or through the Detroit-Windsor Tunnel or even take a ferry boat over international waters to the hopping town of Windsor. Really, for a measly 3 hour drive, Detroit is not looking too shabby. Where else can you drive to in 3 hours and get everything Detroit has to offer? Detroit is being re-defined right before our very eyes, yet it’s still under most Americans’ radar. Detroit is on the upswing. Check out Detroit , it’s big city fun at its best. You won’t be disappointed. My family and I loved it and had a great time there on a recent trip!